Introduction. This paper proposes the development of the concept of design-fits and theoretical profiles for aligning information systems design and business strategies in terms of March and Smith's four main information technology artefacts: constructs, models, methods and instantiations. Method.The main research strategy adopted is an interpretative, in-depth case study. We selected SaveCom, a Taiwanese telecommunications company, to explore issues related to design-fits. This research is primarily based on twenty-two interviews with middle and top managers at SaveCom, supported by secondary information. Analysis. The analysis incorporated three major phases of description (relying heavily on verbatim quotes from interviewees), analysis (identifying important factors, themes, and relationships), and interpretation (making sense of meanings in context). Results.The research proposes three mechanisms of design fit: content fit, which offers an alignment between the nature of business strategic requirements and the spirit of information technology design; structural fit, which involves the alignment of the organizational structural conditions and information technology procedures; and social fit, which considers the alignment of human factors and information technology usage design. Conclusions. Design fit is a complex process and effort must be made to understand dynamic and adaptive alignment processes that can aid the execution of information technology strategy. As the failure to take maximum advantage of information technology may seriously hamper a firm's performance and viability (Venkatraman 2000; Avison et al. 2004), information systems-business alignment is fundamental to all organizations. Strategic alignment, the integration of strategies relating to the business and its information technology and information systems, has always been of interest to researchers and practitioners. Previous studies (e,g., Premkumar and King 1991; Tarafdar and Qrunfleh 2010; Velcu 2010) on strategic alignment have concentrated almost exclusively on understanding the integration of information systems planning with business strategy. In this research stream, most of the research (e.g., Burn and Szeto 2000) agrees that, by means of strategic information systems planning (Sinformation systemsP), strategic alignment enables information systems to support business strategies more effectively. However, despite a growing body of research, a number of gaps can be identified in the literature. First, as many previous studies claim (e.g., Kearns and Lederer 2000; Avison et al. 2004; Lesca and Caron-Fasan 2008), the need to align business and information systems planning has been emphasised as both critically important and increasingly problematic (Burn and Szeto 2000), and few studies focus on how organizations actually achieve alignment (Luftman 2000). Conceptually, we know that, by aligning the information systems plan and the business plan, information resources can support business objectives and take advantage of opportunities for strategic use of information systems (Premkumar and King 1991), but there is a lack of agreement in the literature as to how firms do and should align. Second, the nature and scope of alignment is inadequately clarified in the literature (Avison et al. 2004). As Reich and Benbasat (2000) argue, planned information technology/information systems strategy is a necessary but not a sufficient contributor to effective alignment. Achieving alignment requires an ongoing effort of strategic planning, goal realignment, and implementation of best practices in support of and shaping business strategies (Chen 2010). In particular, strategic alignment is a continuous and dynamic process (Croteau et al. 2008; Luftman 2000), rather than a planning-oriented approach to business objectives only (Avison et al. 2004). The extent to which strategic information systems planning meets its objectives is determined by implementation, including information systems design and deployment (Gottschalk 1999), but the alignment in information systems design and deployment has been underemphasised. In fact, system development is fundamentally a process of design (Arnott 2006), and using a system that is not well designed can lead to inferior outcomes at the organizational level (Ba et al. 2001). For example, systems can be fault-tolerant and easy to use but may fail to contribute to the organization's goals (Ba et al. 2001). Corresponding to these research gaps, this study addresses two specific questions. First, how do organizations really design their information systems with respect to their business strategies? Secondly, and building on the first question, what are the mechanisms of design fit through which alignment can be achieved? We argue that information systems is often designed and deployed primarily to solve pressing functional and technical problems, without regard for overall strategic considerations (Grant 2003); to understand the concept of design fit is important to the ability to maintain alignment efforts in strategic planning. Using a case study of SaveCom, a Taiwanese telecommunications company, this article explores the concept of design-fits, which refers to the strategic alignments in the enterprise system design. The theoretical profiles for aligning information systems design and business strategies are developed in terms of March and Smith's (1995) four main information technology artefacts: constructs, models, methods and instantiations. The results of this study could be useful to researchers and practitioners interested in strategic alignment in the enterprise system design. The remainder of the paper is organized as follows. First, the background of strategic alignment, the role of design-fits in the strategic alignment research, and the concept of information technology artefacts are discussed briefly. Next, the research approach is described. A description of the case follows, where the information systems design and development and their effects on aligning the business strategy are analysed in terms of March and Smith's (1995) four main information technology artefacts. Following is a discussion of three proposed mechanisms of design-fits. The conclusion highlights the implications of the findings for both research and practice, along with suggestions for future research. The focus of this paper aims to outline how organizations achieve alignment and design their information systems with respect to their business strategies. In this section, a review of strategic alignment, the proposed concept of design-fits and information technology artefacts are provided. Strategic alignment has many synonyms, including fit, integration, bridge, harmony, fusion, and linkage (Avison et al. 2004; Luftman 2000). Alignment helps an organization achieve superior business performance while executing business strategies and improving the return on information technology investment (Byrd et al. 2006; Sabherwal and Chan 2001). Accordingly, the importance of alignment has been well known and well documented since the late 1970s (e.g., Luftman 2000; Grant 2003; Chen et al. 2010) and has been consistently ranked as the number one concern of information technology and business executives (Luftman et al. 2006; Chen 2010). The need to link the information systems planning process with business planning is critical to business success and to ensuring information systems planning process success (Sabherwal and Chan 2001; Croteau and Bergeron 2001). The well-known strategic alignment model (SAM) proposed by Henderson and Venkatraman (1993) was the first to describe clearly the relationship between business strategies and information technology strategies. This model is defined in terms of four fundamental domains of strategic choice: business strategy, information technology strategy, organizational infrastructure and processes, and information technology infrastructure and processes, each of which has its own underlying dimensions. The model also assesses alignment based on strategic fit and functional integration. Employment of an alignment model such as this assists a firm in three ways: by maximising return on information technology investment, by helping to achieve competitive advantage through information systems, and by providing direction and flexibility to react to new opportunities (Avison et al. 2004). Figure 1 depicts how the current study fits into the overall body of literature on strategic alignment. We suggest that the alignment can be divided into two phases embraced by dotted lines: planning alignment and implementation alignment. The key activities (shown as circles in Figure 1) can be distinguished as seeking strategic fit in the planning alignment phase, and seeking design fit and deployment, management, use in the implementation alignment phase. The inputs, outcomes and factors impacted on these two phases are shown as rectangles. For example, both phases are influenced by the social dimension, including social constructs like the level of communication, connection and knowledge-sharing, and organizational constructs like the governance mode, structure, and organizational control (Reich and Benbasat 2000). In the planning alignment phase, information systems strategies should both derive from and shape business strategies in a dynamic environment (Grant 2003). Efforts in this phase constitute social alignment (Reich and Benbasat 2000), which describes information technology-business partnerships at various organizational levels. By fostering cross-domain knowledge and building a dialogue between information technology professionals and functional mangers, information technology professionals understand more about the organization and its business and functional managers become familiar with existing and possible uses of information technology in the context of the firm and its industry (Peppard 2001). At this point, Sinformation systemsP may include phases like strategic awareness, situation analysis, strategy conception, strategy formulation and strategy implementation planning (Mentzas 1997). Each of the phases involves specific tasks, so the phases and tasks represent the components of the planning process. Sinformation systemsP precedes the detailed project planning that takes place for each project much later, during system development, and that probably has greater impact on the budget, deadlines, and quality objectives than on alignment objectives (Newkirk et al. 2008). Thus, such planning formulates the information systems strategy, which focuses on systems or business applications of information technology (Earl 1989). information systems strategy is also the plan of action and is concerned primarily with aligning information systems with business needs and using them to drive strategic benefits. Therefore, an information systems plan can be derived by aligning information systems strategy and business strategy. Typically, a business strategy is produced first, but in those cases in which an information systems strategy is produced first or simultaneously, a business strategy may need to be changed in order to realise alignment (Newkirk et al. 2008). As Reich and Benbasat (2000) argue, planned information technology/information systems strategy is a necessary but not a sufficient contributor to effective alignment. Some research (e.g. Sabherwal and Chan 2001) examines the direct impacts of alignment on perceived business performance or how alignment leads to greater business profitability. However, effective alignment is predicated on the combination of prescient strategic planning and the effective execution of those plans (Grant 2003). Accordingly, conventional links between strategic alignment and business performance ignores the roles of system implementation, including design and deployment. Overlooking the system implementation may lead to failure to carry out the strategic information systems plan and leaves firms dissatisfied with and reluctant to continue their strategic information systems planning (Gottschalk 1999). Our effort focuses on exploring the alignment activities in the enterprise system design. 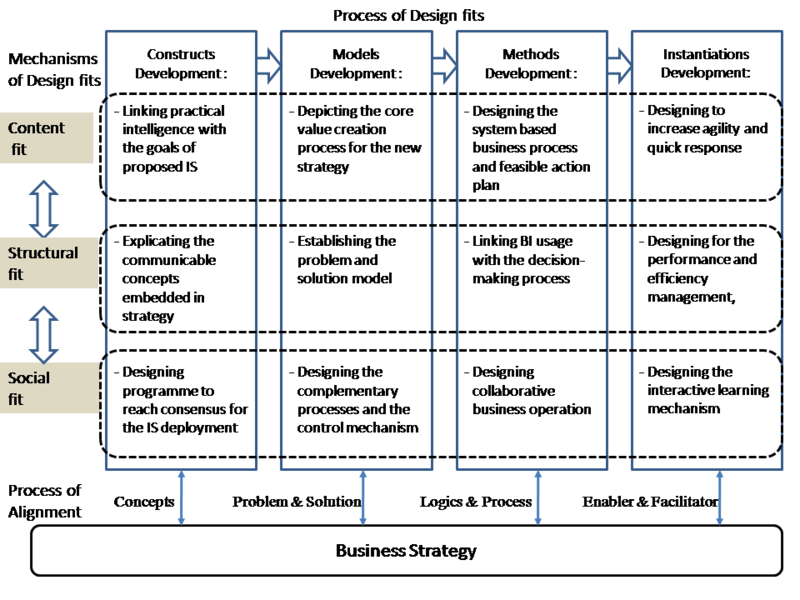 This paper proposes the concept of design-fits, which refers to the strategic alignments in the enterprise system design phase. Effective design-fits present a challenge for two main reasons. First, since information technology is often deployed primarily to solve pressing functional and technical problems without regard for overall strategic considerations (Grant 2003), how information systems can be designed to support the organizational strategic action is still unknown. Second, organizational strategies often emanate from deeply embedded and socially complex processes within a firm (Floyd and Wooldridge 2000), and information technology/information systems is the product of social processes (Markus and Silver 2008). Therefore, how human factors should be taken into account in information systems designs remains to be revealed. Understanding the concept of design-fits is central to the ability to maintain the alignment efforts in the course of strategic planning. Previous research dealt with at least two dimensions in the design of information systems to support organizational processes: the software engineering dimension and the user-acceptance dimension (Ba et al. 2001). This paper employs the concept of information technology artefacts in the design sciences as a lens through which to analyse the strategic alignment processes. information technology artefacts are 'things that serve human purposes' (March and Smith 1995) and this research stream emphasises that the search for an effective problem representation is central to finding an effective design solution. Accordingly, Simon (1996) observes that 'solving a problem simply means representing it so as to make the solution transparent'. Benbasat and Zmud (2003) add that it is necessary to 'conceptualise the information technology artefact as the application of information technology to enable or support some task(s) embedded within a structure(s) that itself is embedded within a context(s)'. Since information technology artefacts are created to enable the representation, understanding, and development of successful information systems within organizations (March and Storey 2008), they should be closely aligned with business strategy to ensure that the firm's strategic purpose can be achieved. According to March and Smith (1995), information technology artefacts are of four types: constructs, models, methods and instantiations. Constructs are the vocabulary and conceptualisations that enable communication and the description of a problem, solution components, constraints and objectives for the designed artefact. Models are a set of propositions or statements that express relationships among constructs; models use the constructs to represent a problem and its solution space. Methods are algorithms or guidelines for the solution space that enable the construction of instantiations - a computer-based system within an organization - and are goal-directed plans for manipulating constructs so the solutions statement model is realised. Instantiations (also implementations) operationalise constructs, models, and methods, resulting in specific products. Table 1 summarises the major issues, their definitions, and some observational needs in terms of the major issues related to the design of the four artefacts. Constructs Constructs are the vocabulary and conceptualisations that enable communication and description of problem, solution components, constraints and objectives for the designed artefact. How can the constructs of the system design be aligned to fit the organizational strategies? Models Models are a set of propositions or statements that express relationships among constructs. Models use the constructs to represent a problem and its solution space. How can the models of the system design be aligned to fit the organizational strategies? Methods Methods are goal-directed plans for manipulating constructs so the solution statement model is realised. How can the methods of the system design be aligned to fit the organizational strategies? Instantiations Instantiations (also implementations) operationalise constructs, models and methods, resulting in specific products. How can the instantiations of the system design be aligned to fit the organizational strategies? In this study, the main research strategy adopted is an interpretative in-depth case study. The case research method is particularly appropriate since our main research question is a 'how' question (Yin 2003) and since the case research strategy offers better insights into the inter-dependencies among the factors captured in the study (Benbasat et al. 1987). The data collection and analysis processes are described below. We selected SaveCom, a Taiwanese telecommunications company, to explore issues related to design-fits. The case of SaveCom's business intelligence implementation is particularly appropriate for this study, as that system mainly supports the new organizational strategy and because such systems are becoming an important information technology framework in which the issue of their adoption for strategic purposes is relevant and important. This research is primarily based on twenty-two interviews of middle and top managers at SaveCom, supported by secondary information. All interviews were conducted with managers with at least five years of working experience, who participated in business intelligence implementation projects and who use those systems. Personal interviews were supplemented by direct observations, as well as documents and artefacts, including organizational charts, annual reports, and internal documentation. The multiple sources provided for triangulation (Stake 1994) of evidence, ensuring that the facts stated by one organization could be verified by the others; multiple sources also provided multiple perspectives on issues. All informants were scrutinised carefully and then selected to ensure the quality of the data. The face-to-face interviews were unstructured; the standard set of questions used was designed only to help initiate and guide the interview process. Observations were noted immediately after each interview was completed. Questions were broad in scope and focused on fundamental aspects of business intelligence, the business intelligence design process and SaveCom's strategic actions. Probing followed each question in order to elicit elaborations on answers and to acquire examples of the business intelligence artefacts' design and development process. The data collection and analysis helped identify the effects of artefacts used to address the research objective. Following data collection, data were analysed in two stages, based on the work of Wolcott (1994) and Weaven and Herington (2007). In the first stage, the open coding technique of grounded theory (Strauss and Corbin 1990) was also employed. Open coding is the part of the analysis concerned with identifying, naming, categorising and describing phenomena found in the text, so alignment actions can be identified and categorised and their impacts on strategic alignment can be explored. This process continued until the state of theoretical saturation in the research. For example, based on the analysis of interview data, in terms of time taken, in the construct development phase, linking practical intelligence with the goals of proposed information systems, explicating the communicable concepts embedded in strategy for information systems design, and designing programmes to reach consensus for the deployment the business intelligence system were identified as key activities through open coding. In the second stage, the key activities identified with each artefact (constructs, models, methods and instantiations) were collated into three mechanisms of design fit. For instance, content fit consists of four activities from different artefacts including linking practical intelligence with the goals of the proposed information systems, depicting the core value creation process for the new strategy, designing the system based business process and feasible action plan and designing to increase agility and quick response. The interview transcripts were shown to another researcher who played the role of an independent reviewer in order to bring a different and possibly more objective eye to the evidence (Eisenhardt 1989). The data collection and analysis across the phases helped elicit the mechanisms of design-fits and their influence on the firms' strategic alignment in order to address our research objective. The following sections introduce the case context and the business intelligence design process taken by SaveCom in terms of March and Smith's four main information technology artefacts: constructs, models, methods and instantiations. Established in 1997 as a newly licensed wireless paging system operator, SaveCom merged with an Internet company that owned Taiwan Network Access Point, the first and also the major Internet exchange center in Taiwan, making SaveCom the largest access point for the Taiwanese Internet cafe industry. At that time, SaveCom was dedicated to providing Internet infrastructure systems. Starting in 2003, SaveCom transformed itself from a wireless paging operator to a Voice over Internet Protocol service provider. SaveCom allows businesses to use their existing Internet connections to make phone calls, thereby cutting the monthly cost of conducting business. Currently, SaveCom is the leading provider of these services in Taiwan. As Voice over Internet Protocol technology matured in the period around 2003 to 2004, SaveCom's business began to stabilise. After 2004, upon reexamining their position and industrial environment, SaveCom formulated its strategy to be that of 'providing customised services in niche markets and enhancing customer value'. The main reason it proposed this new strategy was that SaveCom was relatively small and large telecom service companies cannot provide customised service because the operating costs are too high and they can provide only standardised products. Accordingly, to distinguish itself from competitors, SaveCom aims to enhance customer value by offering a full range of customised services to meet unique customer needs. This differentiation strategy intentionally builds high switching costs, since SaveCom's customers are unlikely to attain the same customised services from its competitors. Before 2005, SaveCom's information systems investments were guided for the most part by operation sector information technology requirements. For example, SaveCom has a computer system called the operation supporting system, which is used by all telecommunications service providers to support their processes, such as managing network faults. The development of this system at SaveCom was based on the evolution of the business, so it did not provide a holistic picture when it was developed. In fact, SaveCom had not yet developed and articulated a comprehensive information systems strategy that could provide focus to enterprise-wide information technology systems investment and use, at least in part because SaveCom initially defined itself as a telecom infrastructure provider, rather than as a telecom services provider. In 2005, SaveCom started to consider how information technology could facilitate the business operations and how it could ensure the strategy was implementable. With the help of a local professional consulting association, China Productivity Center, SaveCom started a two-year business intelligence initiative. business intelligence systems combine data gathering, data storage and knowledge management with analytical tools, to present complex internal and competitive information, to both planners and decision-makers (Negash 2004). SaveCom's new information systems plan is to use a business intelligence system to support a new customised services strategy. SaveCom understands that it not only has to provide a reasonable level of quality, to provide good service and to provide a competitive price, but that, by using business intelligence, the customer retention strategy is to identify customers who are likely to leave. Our case study research provides a context in which to examine whether design-fits can be achieved through a series of information technology artefact development phases, such that the actions in each phase are initiated to address the main tasks in the use of design-fits. The following section presents the case analysis and summarises the key findings for the business intelligence system development, along with March and Smith's (1995) four types of artefacts of constructs, models, methods and instantiations. In the early stage of system design, creating explicit concepts that facilitate communication and the ability to describe a problem, solution components, constraints and objectives for the designed artefact is imperative (March and Smith 1995) . Although business intelligence systems have powerful analytic capabilities that can help manage performance across all data sources and that can, in turn, lead to a firm's competitive advantage (Petrini and Pozzebon 2009), at SaveCom, what business intelligence initiatives can contribute to the new strategy is still not clear. SaveCom did not move through system development quickly but created details about the integration between systems and business strategy, since communication and collaboration between business and information technology professionals is often problematic (Alter 2003). In this phase, three main tasks were incorporated: linking practical intelligence with the goals of the proposed information systems, explicating the communicable concepts embedded in strategy for information systems design and reaching consensus for the information systems deployment. This technical experience is a great enlightenment! When we are pro-active, we can detect problems and give answers before our customers ask a question. We can then deliver remedial action and everything will go fine. So I think the spirit of being pro-active should be embedded in the business intelligence initiative. With this insight, the general manager realised that the most important issue for SaveCom to fulfil the new strategy and deliver customer value is to serve their customers pro-actively and, in turn, enhance customer lifetime value. SaveCom's pro-active customer service mode aims to enhance customer value by exceeding customer expectations. In addition, customer retention is very important because acquiring a new customer is far more expensive than keeping an existing one. Therefore, once those customers who are likely to leave are identified, customer retention programmes can be developed and actions can be taken. Accordingly, SaveCom's business intelligence system also designs the analytic techniques for customer churn analysis in order to facilitate its customer relationship management programmes. As Table 2 shows, SaveCom summarises the conceptualisations that enable the communication and description of SaveCom's problems, solution components, constraints and objectives for the business intelligence system. In its early history, SaveCom was focused on research and development of automation systems services technology, neglecting even market positioning strategy; at that time, the company's most important strategic objective was 'survival'. When the company formulated its strategy as 'providing customised services for customers in niche markets', constructs such as pro-activity, customer value, and churn analysis clearly depicted SaveCom's strategic direction for the value creation process and SaveCom's customer orientation. I think that the business intelligence camp is really nice because you know what our targeted market is!... As indicated by our GM, we have increased customer switching costs. When large telecom service companies cannot provide customised service, this is a niche market for SaveCom because we can even provide customised services for small business. Using business intelligence can enhance our agility in responding to our customers. The concept of business intelligence-enabled pro-activeness was inspired by the hardware detection system but was embedded as the spirit (goals and values) of SaveCom's business intelligence systems. The camp maintained an emphasis on the relationships between the business intelligence mechanism, agile customer response and the firm's service processes. Emphasising the change in target market is important and efforts are needed to reach a consensus among managers to ensure this goal can be achieved. In the second phase, SaveCom focused its efforts on model development. The three major constructs in Table 2, pro-activity, customer value, and churn analysis and customer relationship management, were key considerations and functions for SaveCom's business intelligence development project. The constructs, which were determined by the general manager and the senior management, incorporated their insights to fulfil SaveCom's new strategy. SaveCom then needed to design and propose models, which are a set of propositions or statements, that express relationships among the constructs that are used to represent a problem and its possible solutions (March and Smith 1995). SaveCom required the discipline and vision to foresee problems and opportunities in a turbulent and complex environment and the ability to take decisive action using new technologies (Grant 2003). In this phase, three main tasks were identified: depicting the core value creation process for the new strategy, establishing the problem and solution model, and designing the complementary processes and the control mechanism for information systems. Since pro-active customer value creation is the driving force for SaveCom's new strategy, the first thing that the top management emphasised was that the future growth and profitability model had to ensure that SaveCom not only focuses on the performance, but also on customer value. SaveCom studied its growth and profitability model for the new strategy and aimed to design a business intelligence system that could emphasise that pro-active customer value creation is everything for driving SaveCom's value creation. Conventionally, SaveCom used only performance-oriented management and often the cause of the problem of performance targets was unclear, or not properly aligned with the ultimate goal of creating profits. For example, before the development of business intelligence, SaveCom's main strategy was the 'maximum number of customers' to increase the company's revenue but the relationship between the number of customers and how SaveCom created value was unclear. We create our own niche. The pro-active concept redefines our value creation strategy from the maximum number of customers to customisation for our profitable customers and retaining valuable customers. Properly executed, it is an approach for management that aligns a company's overall aspirations, analytical techniques and management processes to focus on customer value creation. Now, with the pro-active customer value management, our progress is to change from customer complaints to customer admiration. It cannot be achieved suddenly but step-by-step, and by turning customer admiration into word of mouth. ... If our customer satisfaction has increased, their contribution and lifetime value have increased as well. We can then do more cross selling or up selling. 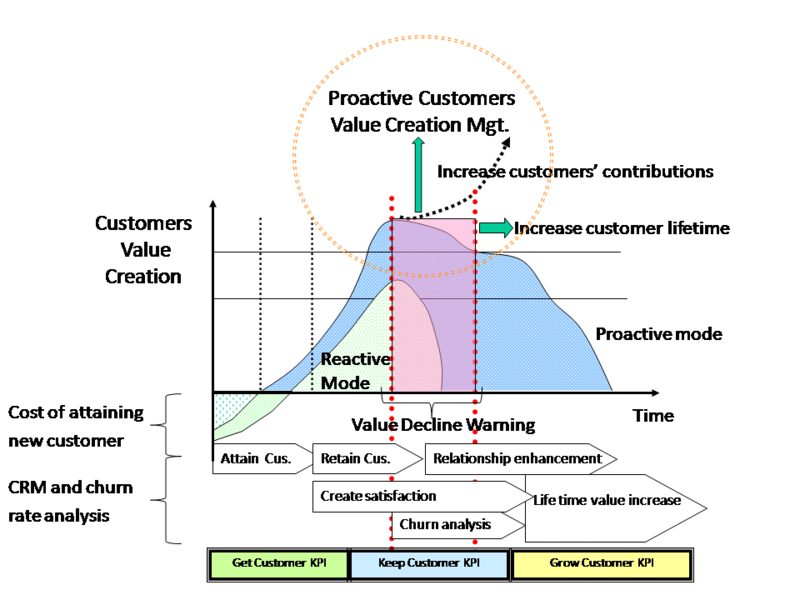 This model (Figure 2) also shows several CRM-related programmes, such as attainment and retention of customers, relationship management, customer lifetime value and satisfaction, that need to be taken into account over time. In addition, customer churn analysis helps SaveCom to understand customers' expectations and satisfaction levels. In addition, business intelligence has the capability for formal measurement to see how to get customer KPI, keep customer KPI and grow customer KPI in order to help manage performance across all data sources and thereby enable customer value controls. The business intelligence system should also pro-actively send a value decline warning to the managers. For the short-term, just-in-time remedial actions can be taken immediately; but for the long-term, SaveCom also uses business intelligence for performance management to strengthen the planning and manipulation of key performance variables. With the development of this new model, SaveCom hoped to change its value creation process by increasing customer lifetime value. It is clear that, given its limited focus on pro-active customer value creation in the past, SaveCom's service delivery was not customer-oriented. As a result, efforts were needed to ensure that new systems and the embedded organizational process are aligned with organizational goals (Ba et al. 2001). The idea of improving customer service quality in the telecom service delivery is a driving force behind moves toward better performance. Improving service quality and profitability through business intelligence can even be regarded as a strategic imperative, but in the face of increasing customer demands and more sophisticated customer services, SaveCom had to do a better job of integrating its existing service procedures and control mechanisms. We have to conduct a customer performance analysis after we visit a potential customer in order to evaluate the margins of this customer before we move a step further. We also classify our customers into A/B/C levels in terms of profitability and make a decision on how much resource we can input. Having identified and developed its key model for the business intelligence system, SaveCom focused on the goal-directed plans for manipulating constructs in order to realise the solutions statement model (March and Smith 1995). The information systems contains information about significant people, places and things within the organization or in the surrounding environment. Then SaveCom focused on the functions of infrastructure, decisions and system components, and administration components in a real information system. In this phase, three main tasks were identified: designing the system-based business process and feasible action plan, linking business intelligence usage with the decision-making process, and designing collaborative business operations. Alignment evolves into a relationship in which the information technology function and other business functions adapt their strategies together (Luftman 2000). To realise pro-active customer services and to achieve its strategy, SaveCom proposed several methods for the business intelligence initiative, including pro-active performance, decision and action service operations; automatic customer value analysis; collaborative business operations; and a telecom services professional knowledge base. Pro-active performance, decision and action service operation is used in this study as an exemplary business intelligence method to describe how it guides the solution space. Figure 3 shows the method SaveCom proposed for its business intelligence system. 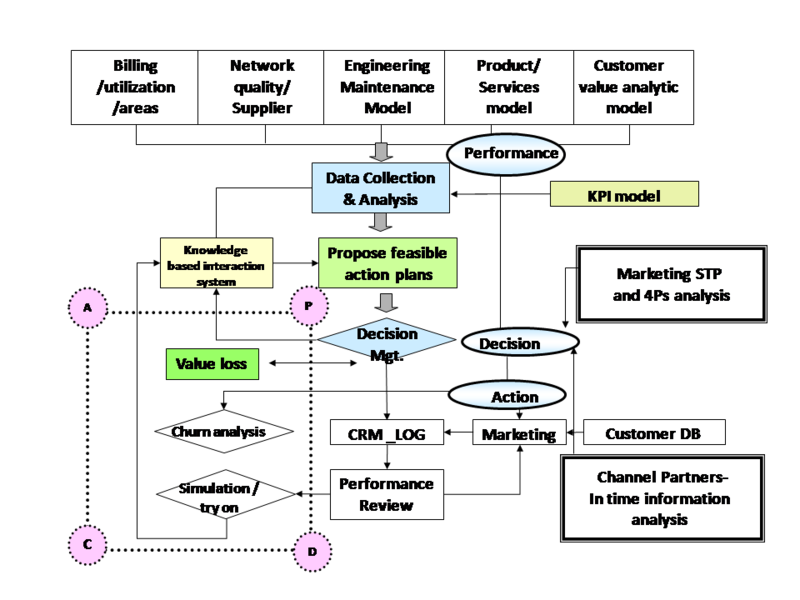 Figure 3 shows how the service operation method collects information from customer value information, engineering maintenance, operational intelligence and transactional applications. By integrating corporate-wide performance data, SaveCom capitalises on the value of its data in order to propose a feasible action plan pro-actively. We separate our customer data into two groups: utilised and underutilised. By using the factor analysis method, we can extract the variances between these two groups and formulate marketing strategies. In addition, the data mining techniques also explore the critical figure of churn customers. We can produce a "name list" of possible churn customers and we then ask our account manager to contact those customers immediately and consider the customer care actions that must be taken to retain those customers. I consider knowledge management very important. Before then, we made decisions by our personal experiences and intuitions. However, sometimes you will find that it is far beyond what you can imagine. Business intelligence shows that the expansion of our business has depended on these external sales forces. Now we have more information about the status of these external sales forces, and we can also provide more information to them. The business intelligence system enables them to acquire information promptly and it is also highly interactive. Business intelligence is a great help to enhance the transparency of data. In this phase, SaveCom focused its efforts on systems development, including software development, database administration and system architecture, in order to strengthen the overall operation. 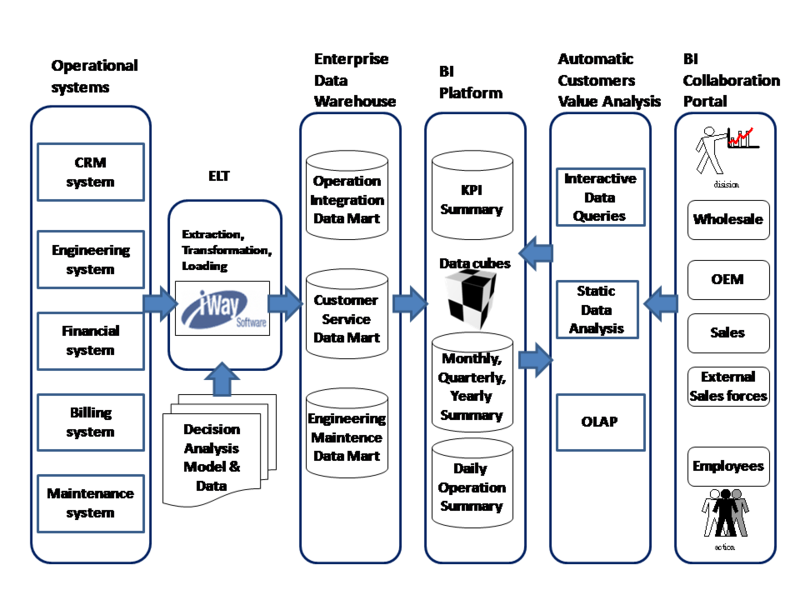 Figure 4 shows SaveCom's business intelligence architecture: the basic components of SaveCom's business intelligence system are the operation system, data extraction, transformation, and loading processes, data warehouse, business intelligence applications, automatic customer value analysis, and business intelligence portal. In this phase, three main tasks were identified: designing to increase agility and quick response, designing for performance and efficiency management, and designing the interactive learning mechanism. Yes, the business intelligence is meaningful to us. We can interact with the system and transform the data into useful information. Since we can interact with business intelligence quickly, we can find out the market-related information and knowledge. In turn, the meaning and consequences of these data are becoming more significant than ever. SaveCom's business intelligence was designed to drive pervasive intelligence across the enterprise and to align the strategic purpose, financial and operational management processes by integrating the information from financial performance management, operational intelligence and transactional applications. SaveCom's business intelligence also has the capability for formal measurement of key performance indicators, that can help manage performance across all data sources and enhance the alignment between resource allocations and business development. The impacts of business intelligence on SaveCom are comprehensive. Using a metaphor, it is just like the vascular system of the human body for transmitting the required nutrients. The information is the general nutrient and the business intelligence system rapidly delivers information to the hands of those who need it, and our response to customer and market demands is accurate. Smart salesmen have become better and better. Even "Rambo" is learning to sit at the office and use data! Business intelligence helps us to clarify our strategic objective and note who our target customers are. Frankly speaking, we all focused on the customer churn analysis in order to understand our customer better, but after using business intelligence, we learn to grab the insights of who are our customers and how to select them. We are getting better on both the conceptual level and with operational skills. Alignment addresses how information technology is in harmony with the business and how the business should or could be in harmony with information technology (Luftman, 2000). Based on the collected data, Figure 5 summarises the tasks that emerged from the case analysis. As the figure shows, design-fit is a complex process and effort must be made to understand dynamic and adaptive alignment processes that can aid the execution of information technology strategy. The case study demonstrates how SaveCom seeks design-fits and we suggest that, in the system implementation process, it carefully develop information technology artefacts that might uphold the efforts of strategic alignment. As Figure 5 shows, each of the phases results in different design information technology artefacts that enable the strategic purpose to be achieved by the system design. Drawing upon our analysis and by examining the phases of design actions or structural arrangements (Nambisan et al. 1999) of alignment in system implementation, we next propose three mechanisms of design-fits: content fit, which offers an alignment between the nature of business strategic requirements and the spirit of information technology design; structural fit, which involves the alignment of the organizational structural conditions and information technology procedures; and social fit, which considers the alignment of human factors and information technology usage design. Given that these mechanisms are inductively derived from the SaveCom case study data, we present how the existing literature corroborates those three mechanisms and how the mechanisms enrich our present understanding of strategic alignment. Luftman (2000) emphasises that the effective exchange of ideas and a clear understanding of what it takes to ensure successful strategies are high on the list of enablers of alignment. Accordingly, both the capability for developing information systems-enabled solutions that primarily address organizational problems, and the capability to implement and integrate the solutions into the organizational context, are important to developing information systems (Carlsson 2007). Information systems represent sets of concepts humans use to organize knowledge about the domains and the attributes of information systems that need to be mapped to business strategy requirements. Thus, content fit concerns what strategic requirements the system design is pursuing. The concepts derived from the business strategy should be organized around the elements and properties of enterprise systems. In the SaveCom case, the company asks the business managers and information technology mangers to articulate what they know about the strategy and encourages them to search for the concepts that best address the strategy. The ability to explain the detailed content of the strategy and to link it with practical intelligence is important for alignment, just as is fostering cross-domain knowledge and building a dialogue between managers to address closed minds (Peppard 2001). The goal is for information technology professionals to understand more about the organization and its business, and for the information technology development team to become familiar with how information technology can be integrated in the context of the firm and its industry. In addition, to execute the intended information systems strategy effectively, the organization will need to identify the capabilities required for delivering the information technology solutions (Grant 2003). As a result, SaveCom considered a wide range of strategic situations by depicting the core value-creation process for the new strategy in terms of the nature of the new strategy and the current situation. In aligning the strategic requirements with the system design, business professionals and information technology professionals should view all elements of the system in terms of what happens in reality and discuss a real-world situation that avoids focusing solely on information needs, computerised information, or information technology (Alter 2003). Accordingly, it is important for SaveCom to align those information systems-enabled value-creation processes into the business intelligence design. Next, we argue that a system-based business process and feasible action plan also need to match with the new strategy requirement, so the information technology-business alignment can go through from the strategic level to the tactical level at the systems design phase. In particular, business success depends on the links between business strategy, information technology strategy, organizational infrastructure and processes, and information technology infrastructure and processes (Burn and Szeto 2000). Since organizational processes are increasingly embedded within information systems, business processes should be an important consideration of information systems design (Ba et al. 2001). Finally, SaveCom focused on the process of increasing the speed of information processing, so the design aims to respond quickly to customer needs, which, in turn, creates customer value. When a strategy is first implemented in an organization, management needs to assess how the strategy fits the structural conditions of the organization and whether it is complementary to other elements of the structure and process (Miller 1992). Rules, procedures and structure are also forms of artefacts (Pentland and Feldman 2008) that must be carefully designed to meet the requirements of a new strategy. In particular, as business strategies change, information systems strategies and processes must keep pace. Therefore, structural fit concerns what overall rules and procedures the system design is pursuing. As the SaveCom case illustrates, the first structural problem in the design phase is that interrelated tasks require cross-boundary input from both senior business executives and senior information technology mangers (Newkirk et al. 2008). After identifying and organizing core concepts (i.e. constructs), business professionals and information systems professionals can use them to describe and analyse systems in organizations (Alter 2003); that is, explicating the communicable concepts will help in organizing and codifying concepts and knowledge related to information systems. Structural alignment concerns the degree of fit between an organization's structure and information systems's decision-making structure (Chan 2002). To fit their strategic demands, organizations have to restructure their business models and processes so information can move smoothly across the different functions. In the SaveCom case, a new problem and solution model was proposed to fit with the new strategy requirement. The information systems that was designed to meet the challenges of SaveCom's telecom business was critical to the success of these business activities and initiatives (Ba et al. 2001). Structural fit emphasises the need to match the strategic considerations with internal context and to reconfigure internal processes to execute a new strategy. In the SaveCom case, the business intelligence system is actually a form of corporate decision support system (DSS). Because a DSS is about human decision processes and how to improve them, DSS development should support the analyst's strategies in order to improve decisions (Arnott 2006). Therefore, in the methods and instantiations development, SaveCom designed the business intelligence systems to match their decision-making processes, performance management and efficiency management. As Avison et al. (2004) point out, some researchers focus on the linking mechanisms to achieve alignment with the social element (who is involved). We note that the design approach is action-oriented and brings people from different disciplines and practices together to pursue a vision and to experiment with new socio-technical designs (Avital et al. 2009). Therefore, the company should look into the social context, including the intentions and actions of key players, when planning an information systems implementation (Orlikowski 1993). 'Poor fit with the culture' is a common explanation for why particular information systemss encounter unanticipated resistance and never meet expectations (Alter 2003). The third mechanism, social fit, concerns who the key players involved in the system design are and how to facilitate their information technology usage. Implementation studies have also highlighted the centrality of informal arrangements by examining relationships, contexts, power structures and the micro-level changes enacted by users (e.g. Orlikowski 1996). The social factors were taken into account in the design phase. Interaction between business and information technology management takes place through communication, which allows group members to collect information, to make explicit commitments and promises, and to offer moral suasion (Kollock 1998). When faced with increasing customer demands and more sophisticated customer services, SaveCom had to integrate its existing service procedures and control mechanisms more effectively. In aligning the interests of multiple internal stakeholders during the implementation process, organizations put in place formal control mechanisms, such as project-related rules and procedures, that control employee behaviour and help produce desired outcomes (Kirsch 1997). For external stakeholders, SaveCom also emphasised the collaborative business operation with their partners. The social fit also considers the interactive learning mechanism. The effort required in this phase is the incentive alignment so the system's embedded features induce its users to employ the system in a manner consistent with the design objective, resulting in support of the organization's overall goals, such as profitability and value generation (Ba et al. 2001). By fostering the interaction between users and the business intelligence system, the performance of the information systems improves. Content fit can be achieved by linking practical intelligence with the goals of a proposed information systems, depicting the core value creation process for the new strategy, designing the system based business process and feasible action plan, and designing to increase agility and quick response. Structural fit can be achieved by explicating the communicable concepts embedded in the strategy, establishing the problem and solution model, linking business intelligence usage with the decision-making process, and designing for the performance and efficiency management. Social fit can be achieved by designing a programme to reach consensus for the information systems deployment, designing the complementary processes and the control mechanism, designing collaborative business operation and designing the interactive learning mechanism. As Sabherwal and Chan (2001) suggested, even after planning alignment is achieved, environmental changes can reduce alignment because of over-emphasis, complacency and inertia, engendering a need for revolutionary change. Since alignment evolves over time, we argue that the concept of design-fits provides guidance on how to achieve alignment in the system design phase and what management can do to maintain the alignment efforts in the planning phase. The managerial implication of the design-fits concept is that, if properly designed and implemented, information systems can be practically useful for strategic purposes. The limitations of the case study methods of this paper have been acknowledged. We believe that our study has produced a very useful information technology artefacts analysis, that contributes to the information systems design literature and supports the idea of implementing organizational strategy gradually, in stages. Since there are very few empirical studies on strategic alignment of information systems systems in the design phase, this study contributes to knowledge in the subject area. Alter, S. (2003). 18 reasons why information technology reliant work systems should replace "the information technology artifact" as the core subject matter of the field. Communications of the Association of Information Systems, 12(1), 365-394. Arnott, D. (2006). Cognitive biases and decision support system development: a design science approach. Information Systems Journal, 16(1), 55-78. Avison, D., Jones, J., Powell, P. & Wilson, D. (2004). Using and validating the strategic alignment model. Journal of Strategic Information Systems, 13(3), 223-246. Avital, M., Boland, R. & Lyytinen, K. (2009). Introduction to designing information and organizations with a positive lens. Information and Organization, 19(1), 153-161. Ba, S., Stallaert, J. & Whinston A. (2001). Research commentary: introducing a third dimension in information systems design - the case of incentive alignment. Information Systems Research, 12(3), 225- 239. Benbasat, I., Goldstein, D.K. & Star, S.L. (1987). The case research strategy in studies of information systems. MIS Quarterly, 11(3), 369-386. Benbasat, I. & Zmud, R.W. (2003). The identity crisis within the information systems discipline: defining and communicating the discipline's core properties. Minformation systems Quarterly, 27 (2), 183-194. Burn, J.M. & Szeto, C. (2000). A comparison of the views of business and information technology management on success factors for strategic alignment. Information & Management, 37(4), 197-216. Byrd, T., Lewis, B. & Bryan, R. (2006). The leveraging influence of strategic alignment on information technology investment: an empirical examination. Information & Management, 43(3), 308-321. Carlsson, S. (2007). Developing knowledge through information systems design science research: from whom, what types of knowledge, and how. Scandinavian Journal of Information Systems, 19(2), 75-86. Chan, Y.E. (2002). Why haven't we mastered alignment: the importance of the informal organization structure. MIS Quarterly Executive, 1(2), 97-112. Chen, L. (2010). Business-information technology alignment maturity of companies in China. Information & Management , 47(1), 9-16. Croteau, A. & Bergeron, F. (2001). An information technology trilogy: business strategy, technological deployment and organizational performance. Journal of Strategic Information Systems, 10(1), 77-99. Croteau, A., Léger, P. & Cassivi, L. (2008). The role of life cycle concept in the assessment of interorganizational alignment. Industrial Management & Data Systems, 108(2), 145-161. Earl, M. (1989). Management strategies for information technology. Englewood Cliffs, NJ: Prentice Hall. Floyd, S.W., & Wooldridge, B. (2000). Building strategy from the middle: reconceptualizing the strategy process. Thousand Oaks, CA: Sage Publications. Gottschalk, P. (1999). Strategic information systems planning: the information technology strategy implementation matrix. European Journal of Information Systems, 8(2), 107-118. Grant, G.G. (2003). Strategic alignment and enterprise systems implementation: the case of Metalco. Journal of Information technology, 18(3), 159-175. Henderson, J.C. & Venkatraman, N. (1993). Strategic alignment: leveraging information technology for transforming organizations. IBM Systems Journal, 32(1), 4-16. Kearns, G.S. & Lederer, A.L. (2000). The effect of strategic alignment on the use of information systems-based resources for competitive advantage. Strategic Information Systems, 9(4), 265-293. Kirsch, L. (1997). Portfolios of control modes and information systems project management. Information Systems Research, 8(3), 215-239. Kollock, P. (1998). Social dilemmas: the anatomy of cooperation. Annual Review of Sociology, 24(11), 183-214. Lesca, N. & Caron-Fasan, M. (2008). Strategic scanning project failure and abandonment factors: lessons learned. European Journal of Information Systems, 17(4), 371-386. Luftman, J. (2000). Assessing business-information technology alignment maturity. Communications of the Association for Information Systems, 4(1), 1-49. Luftman, J., Kempaiah, K. & Nash, E. (2006). Key issues for information technology executives 2005. MIS Quarterly Executive, 5(2), 81-99. March, S. & Smith, G. (1995). Design and natural science research on information technology. Decision Support Systems, 15(4), 251-266. March, S.T. & Storey, V.C. (2008). Design science in the information systems discipline: an introduction to the special issue on design science research. Minformation systems Quarterly, 32(4), 725-729. Markus, M.L. & Silver, M.S. (2008). A foundation for the study of information technology effects: a new look at DeSanctis and Poole's concepts of structural features and spirit. Journal of the Association for Information Systems, 9(10/11), 609-632. Mejias, R.J., Shepherd, M.M., Vogel, D.R. & Lazaneo, L. (1997). Consensus and perceived satisfaction levels: a cross-cultural comparison of GSS and non-GSS outcomes within and between the United States and Mexico. Journal of Management Information Systems, 13(3), 137-161. Mentzas, G. (1997). Implementing an information systems strategy - a team approach. Long Range Planning, 10(1), 84-95. Miller, D. (1992). Environmental fit versus internal fit. Organization Science, 3(2), 159-178. Nambisan, S., Agarwal, R. & Tanniru, M. (1999). Organizational mechanisms for enhancing user innovation in information technology. Minformation systems Quarterly, 23(3), 365-395. Negash, S. (2004). Business intelligence. Communications of the Association for Information Systems, 13(1), 177-195. Newkirk, H., Lederer, A. & Johnson, A. (2008). Rapid business and information technology change: drivers for strategic information systems planning. European Journal of Information Systems, 17(3), 198-218. Orlikowski, W.J. (1993). CASE tools as organizational change: investigating incremental and radical changes in systems development. Minformation systems Quarterly, 17(3), 309-340. Orlikowski, W.J. (1996). Improvising organizational transformation over time: a situated change perspective. Information Systems Research, 7(1), 63-92. Pentland, B. & Feldman, M. (2008). Designing routines: on the folly of designing artefacts, while hoping for patterns of action. Information and Organization, 18(4), 235-250. Peppard, J. (2001). Bridging the gap between the information systems organization and the rest of the business: plotting a route. Information System Journal, 11(1), 249-270. Petrini, M. & Pozzebon, M. (2009). Managing sustainability with the support of business intelligence: integrating socio-environmental indicators and organizational context. Journal of Strategic Information Systems, 18(4), 178-191. Premkumar, G., & King, W.R. (1991). Assessing strategic information systems planning. Long Range Planning, 24(5), 41-58. Reich, B.H. & Benbasat, I. (2000). 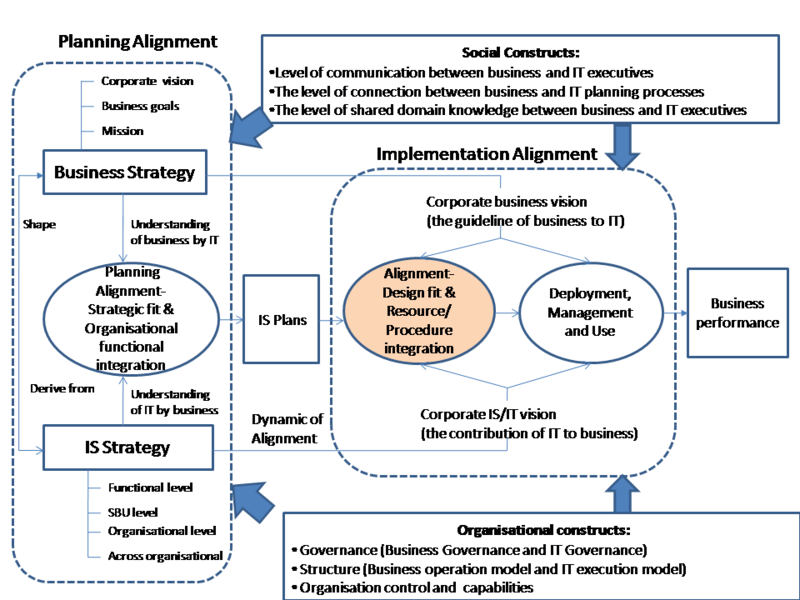 Factors that influence the social dimension of alignment between business and information technology objectives. Minformation systems Quarterly, 34(1), 81-111. Sabherwal, R. & Chan, Y. (2001). Alignment between business information systems strategies: a study of prospectors, analyzers, and defenders. Information Systems Research, 12(1), 11-33. Simon, H.A. (1996). The science of the artificial. (3rd ed.). Cambridge, MA: MIT Press. Stake, R. E. (1994). Case Studies. In Denzin, N. K. & Lincoln, Y. S. (Eds. ), Handbook of Qualitative Research (pp. 236-247). Thousand Oaks, CA: Sage Publications. Strauss, A. & Corbin, J. (1990) Basics of qualitative research: grounded theory, procedures and techniques. Newbury Park, CA: Sage Publications. Tarafdar, M. & Qrunfleh, S. (2010). Examining tactical information technology - business alignment. The Journal of Computer Information Systems, 50(4), 107-116. Venkatraman, N. (2000). Five steps to a Dot-Com strategy: how to find your footing on the web. Sloan Management Review, 41(3), 15-28. Velcu, O. (2010). Strategic alignment of ERP implementation stages: an empirical investigation. Information & Management, 47(3), 158-166. Weaven, S. & Herington, C. (2007). Factors influencing governance choice and human resource management within services franchising networks. Journal of Management & Organization, 13(2), 126-144. Wolcott, H. F. (1994). Transforming qualitative data: description, analysis, and interpretation. Thousand Oaks, CA: Sage Publications. Yin, R. K. (2003). Case study research, design and methods. (3rd ed.). Newbury Park, CA: Sage Publications.